Diesel multiple units (DMUs) were first built to reduce cost on low traffic branches. 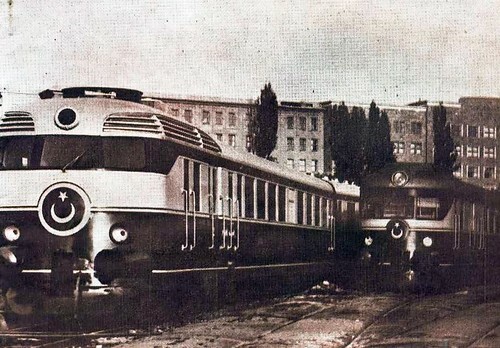 However, in 1932, the German railways demonstrated for the first time in Europe, a DMU designed for premium services. This was the Fliegender Hamburgeroperated at the beginning by the SVT877, an experimental DMU 2-section train. The concept of light, fast and comfortable diesel train for high speed inter city spread quickly across Europe. 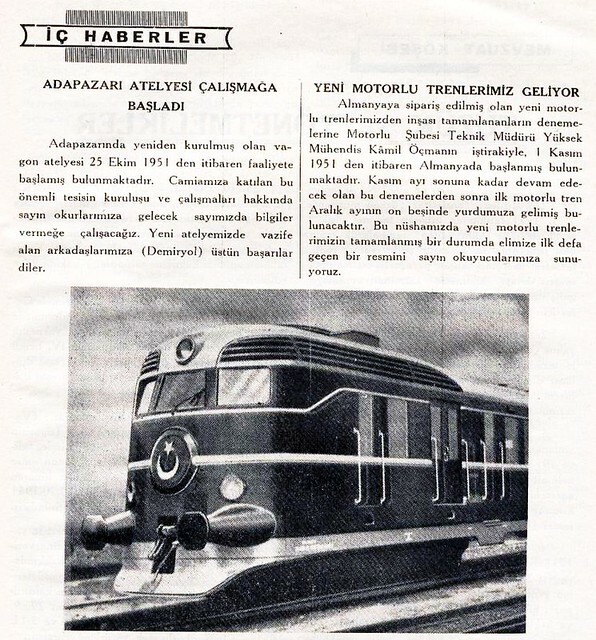 In 25 October 1940, Turkish State Railways (Türkiye Cumhuriyeti Devlet Demiryollar, TCDD) placed an order for six diesel railcars with MAN. 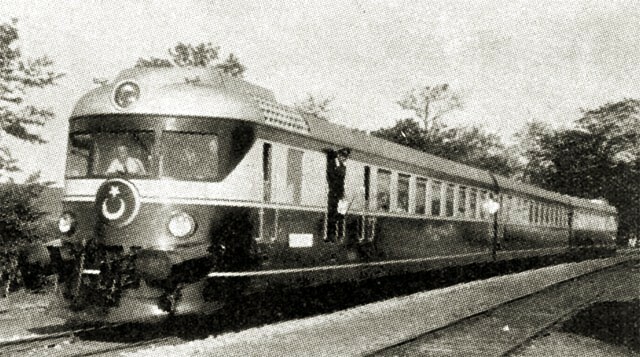 Each unit had two motor cars of 420 HP each. Nuremberg engineers designed a sturdy unit with a large cooling system very proeminent on each car roof. Each car had the same size, they both had a motor on the outer ends and similar external appearance but their internal layout was different. The class was designated MT5200, "MT" being for mototren. The A car had a luggage compartment between the motor and the boarding platform. Then came two second class compartments divided in their middle by a toilet / washroom. Finally, a small buffet compartment was provided. The B car had also a luggage compartment that was set up for the transportation of mail and valuable goods. This compartment had a lockable cabinet. Then came a second class compartment, the toilet washroom and finally the first class compartment. The 12 cylinders MAN diesel engine was bogie mounted and the power transmission was made by a semiautomatic gearbox. The unit could travel at a 120 km/h top speed. War events disrupted the manufacturing and the delivery of these units since only the first two could reach Turkey. Of other four, three units went to the Slovak railways and one stayed in Germany. However, TCDD was satisfied enough with the MT5200 to place another order again with MAN for the MT5300. It is recorded that MAN received an order for two cars which were delivered on the 15 July 1954 (serial number 140 866 / 140 867). The exact type of this car is not known but it is likely to be an intermediate trailer to transform the unit into a 5200 a/c/b. The two 5200 sets could then be used along with the MT5300, despite being of lower power. a good aerodynamic performance with a streamlining of the ends. Skirts are placed on the lower parts of the bodyshell to reduce the drag caused by turbulence between the track and the car. But the MT5300 benefits also from the latest advance of the time, in particular the increase in power and reliability of diesel engines. MAN designed and supplied the mechanical parts for all the units. The diesel engine and the transmission were mounted on the bogie. They were similar to the VT085 manufactured at the same time by MAN for the DRG. The two motor units were identical. The engine room was located at each outer end of the unit, just behind the driver. Then came a luggage compartment and the passenger lounge. The MT5300 could be coupled and operated in multiple sets. These DMU were designed for long haul journey and therefore, the passenger level of equipment was to the highest standard. The central trailer had a dining room area, a bar and a small kitchen. "The TCDD are delighted that the next stage of our journey is to be in their crack train, the Bogazici Ekspresi (Bosphorus Express). 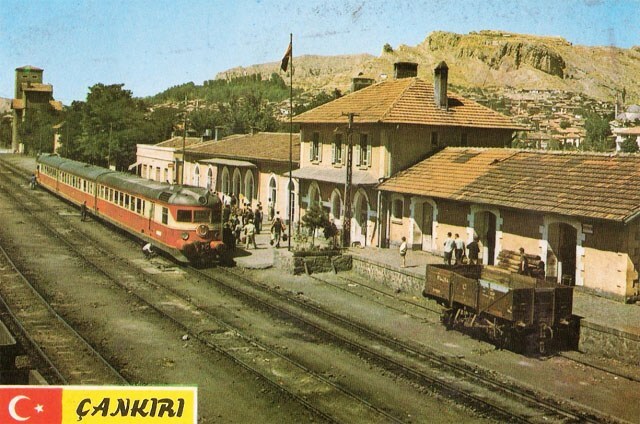 This 'Mototren' takes only 8½ hours for its daily run between the capital and Haydarpaşa, reaching Eskişehir, 263 kilometers from Ankara, in three hours and thirty-nine minutes. Fitted with air-conditioning, all the coaches have numbered and reserved seats. For this train reservation is essential; the Mototrens have priority and reach their destinations on time. 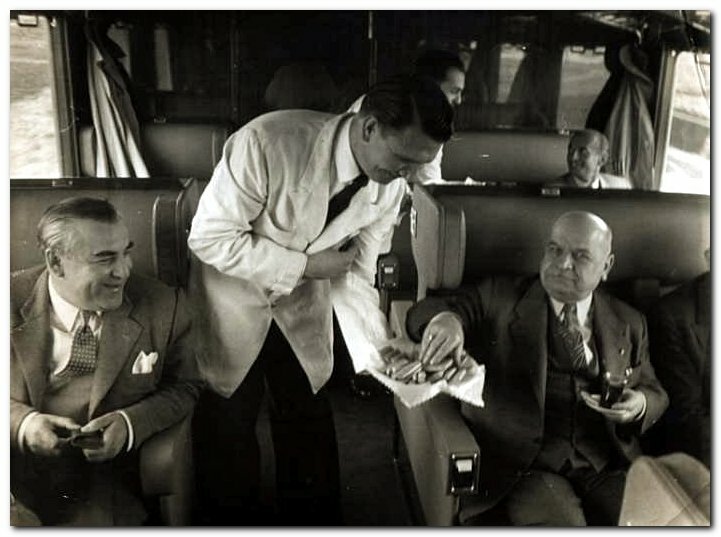 One of the coaches is fitted out as a dining saloon, which serves breakfast as soon as the train starts. Up to the end of 1966, the Wagons-Lits operated these diners, though not those in the second-class-only diesel trains". In those days, the steam train took about 14 hours for the same trip. 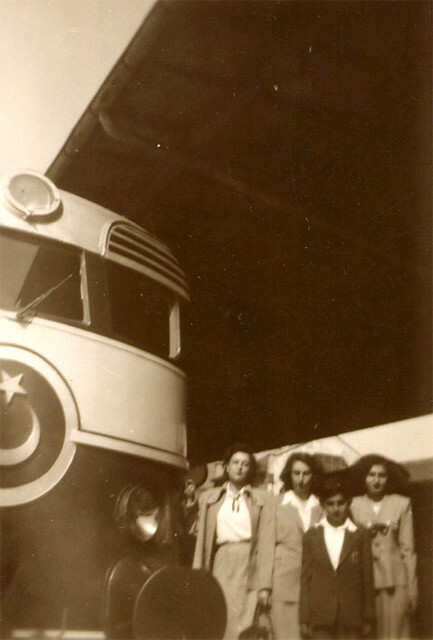 This reminds us that DMU had a brilliant past in Turkey. Just like their cousins in Europe, the diesel-electric powertrain required a very careful maintenance to stay reliable. This was difficult in Turkey where experience with diesel traction was still limited at the time and where operating conditions were very tough. On many occasions, TCDD had to haul the units with a diesel locomotive, or even a steam engine. The MT5300 were withdrawn from service in the 1970's, a bit before the end of their useful life.